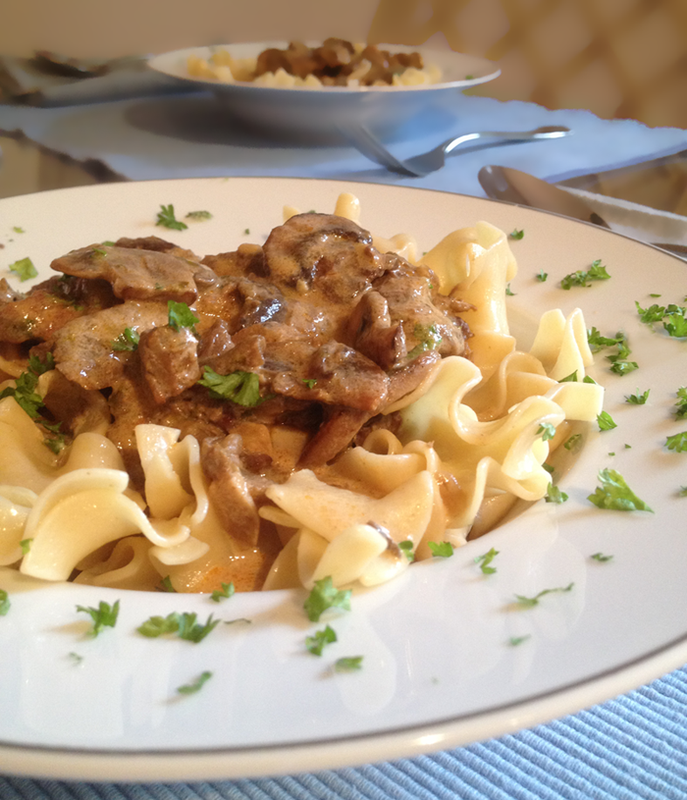 Before you put the slow cooker away for the season, here's one to try. The beef is so tender and flavorful you won't believe it. 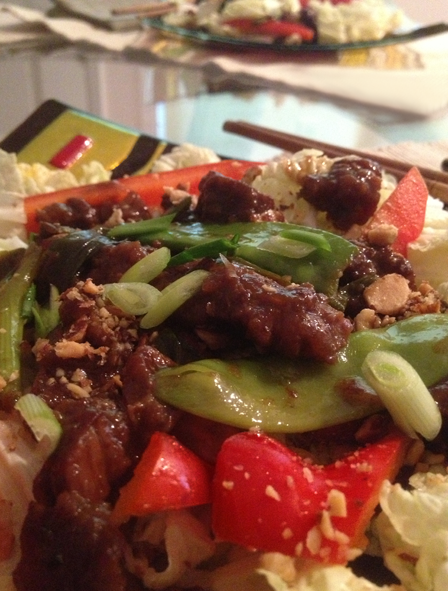 I found a slow- cooked Mongolian beef recipe on allrecipes.com and was able to make some changes that were more suited to the blog and my kitchen. Aside from the beef and veggies being sourced locally and organic where possible, I decided make the hoisin sauce myself. This article from cooks.com gave me the confidence to jump in and customize it. Of course, if you have a favorite brand and want to use that, I'm sure it will work. I like to adjust the flavors (and I'm all over experimenting in the kitchen) so I made my own. I was preparing for company coming to town and an uncertain schedule so I needed a meal that would be ready to go whenever the mood struck. I decided to make it a salad for two reasons; it seemed more convenient and I try to avoid cooking rice whenever possible (I assure you my friends are grateful)! As it turns out there were no left-overs (I love it when there are no left-overs). Here it is, late May, Memorial Day weekend is approaching, and it's barely 50 degrees outside! It's too warm to start a pot of stew on the stove, but cool enough to want something that warms you from the inside out. This recipe is a combination of one I saw years ago on America's Test Kitchen and some advice from my mother-in-law who was an old pro at feeding hungry, growing boys and how to make a small amount of steak go a long way. It's slightly more time consuming than the old cream of mushroom soup stand-by but, once you try it, you'll never go back. The vegetables far outweigh the meat in this dish so, if you enjoy savory meals and want to cut down on the amount of red meat you eat, this is a great recipe to try. The extras, like sherry and a bit of tomato sauce, make this a meal fit for company. Serve it in individual bowls, over fancy cut egg noodles and garnish it with snipped parsley. Of course it's also great served family style on a large platter over the noodles. Add a salad and you're done! Edamole? Guacamame? I couldn't decide what to call this stuff! Living in the Pacific Northwest has introduced me to a lot of new foods and turned me away from others; at least seasonally. Take avocados for example, I love them but I can't find them here except in the summer months. Other times of the year we get them from far-off places where they're shipped unripe and never ripen properly. They should be soft and flavorful. I've used all the time-honored tricks (in a bag, at room temp, wrapped in newspaper with an apple slice added) but it just isn't the same. My best efforts produce soft, flavorless avocados and the guacamole is little more than disappointing green stuff on a chip. So, with Memorial Day weekend coming up, I decided to try replacing the avocados with edamame. They're available frozen year-round and some folks are having luck growing them here, in Oregon. If you're interested in planting these in your garden I suggest you read this first. Mother Earth News will walk you right through it! For this recipe, you'll need a food processor. 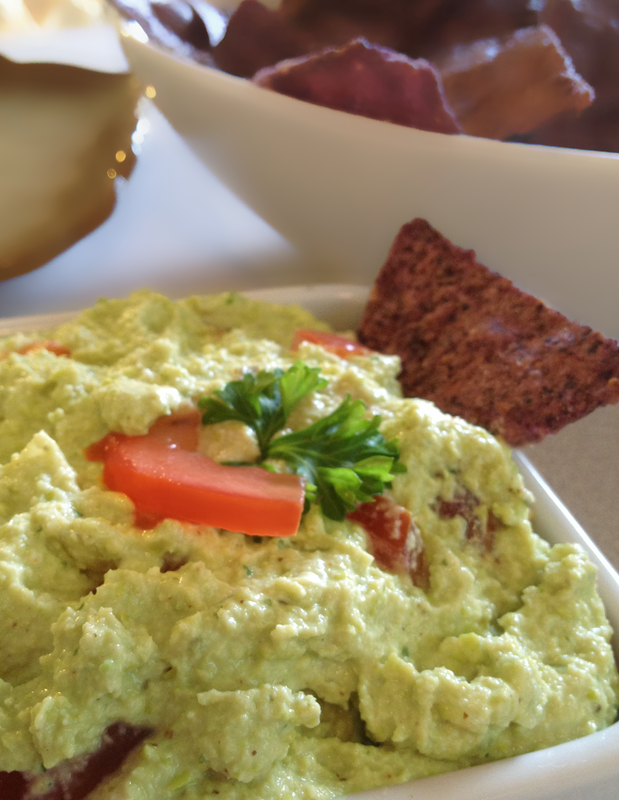 I started out with my favorite guacamole recipe and learned that a few tweaks made for a more flavorful and creamy dip. I hope you enjoy this one. Great for a Spring day! Was there ever a time that you didn't like asparagus? When I was a kid it seemed to be one of those vegetables, like peas, that I could easily do without. 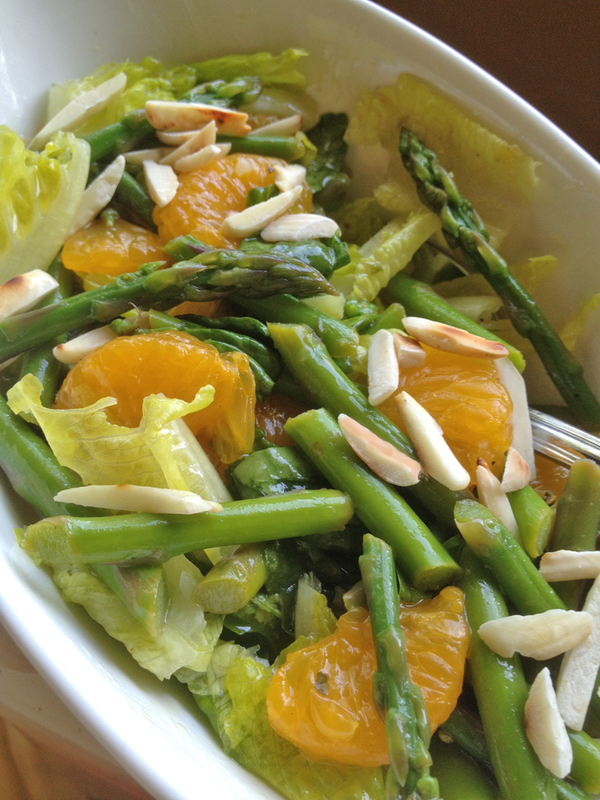 Then I tasted asparagus in a salad -- it was bright green, a little crunchy and, well, kind of sweet. What a difference! I didn't realize that the asparagus (and the peas) I had years ago was over-cooked. It was soggy, flavorless and a most unappealing shade of olive drab. I think it was in the 80's when asparagus became mainstream. We all learned how to cook vegetables properly. Suddenly they were crunchy, brightly colored and the nutrients were still there. Better still, they tasted great! Oh, I just discovered another reason to remember the 80's fondly! Before this my recall of that decade was Madonna, fern bars, and really big hair! As usual, I encourage you to change it up a bit. Make it yours and use whatever dressing you like. I like this lightly dressed with lemon and olive oil dressing so the recipe is included. Are you looking for brunch ideas for Mother's Day? How about adding these mini pies to the menu. They're very easy to make and you can play with the ingredients according to Mom's taste. 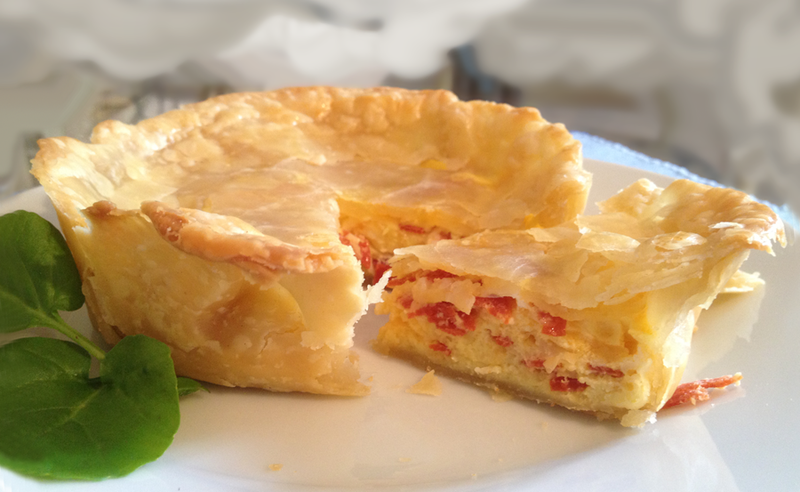 My version is all about cheese with some flavorful pepperoni added to give it a little zest. If you knew my Mom, you'd know how much she appreciates a little zest -- in her food and her life! I made these in ramekins that are 5 inches in diameter and only 1 1/2 inches deep. They cook quickly and are removed from the ramekins before serving. Serve this with asparagus and mimosas. I used to think that Mimosas were simply Champagne and orange juice. 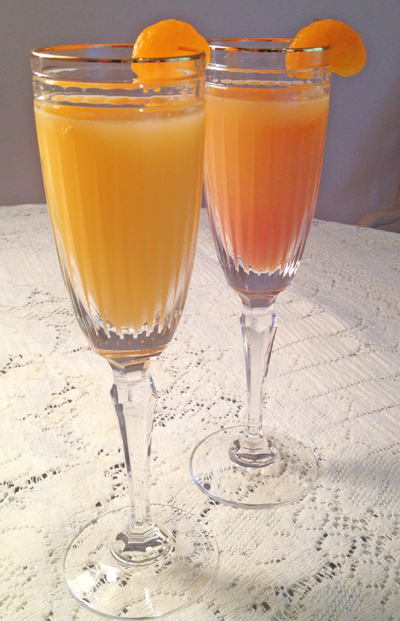 Then I did a little research and found out that authentic Mimosas originated in Paris, France at The Ritz Hotel! All this time we've been making something called a Buck's Fizz, which came from England. The difference is orange liqueur. 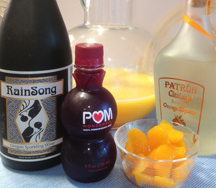 Well, I have some orange liqueur so Mimosa's it is! You can see that I decided to make one a little special and finish it with a teaspoon of pomegranate juice. That's so you can order it for your mom and say, "She'll have a Mimosa, and make it blush!" The great thing about a Mimosa is that it doesn't have to be alcoholic. You can mix them with 7-up and they're just as festive. They just don't make you blush quite as much! In each flute pour orange liqueur. Garnish however you like, I froze mandarin orange slices for this. If you want to make it blush, add 1 teaspoon of pomegranate juice last. It's pretty to watch the drink change color. 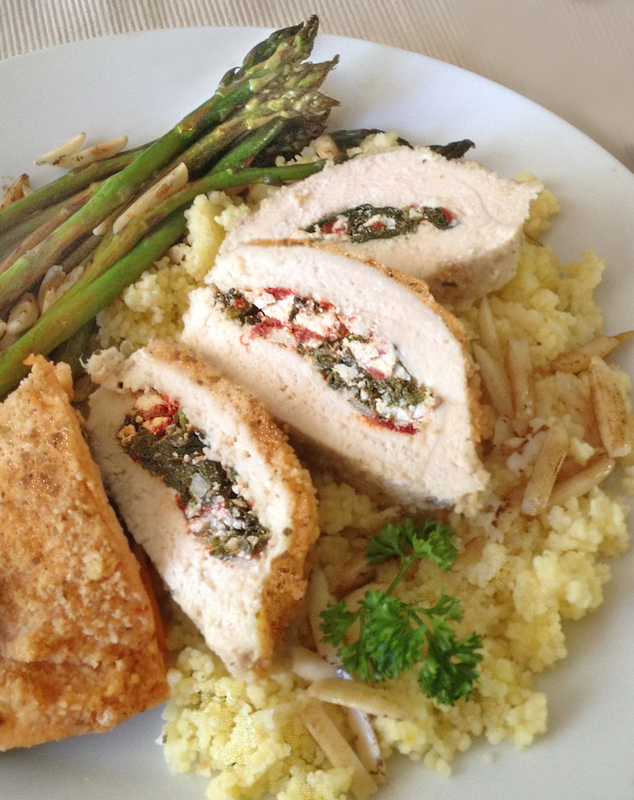 This Greek inspired chicken is filled with feta cheese, fresh spinach and roasted red peppers. The filling keeps the bird juicy, so don't worry about serving dried-out chicken. The only rule here is to get creative. If you like olives, chop some kalamatas and use one per chicken breast. How about sun-dried tomatoes? Feel free to replace the red pepper with them. I like the spinach, feta and garlic combo, so I usually start there -- everything else is flexible. To accompany this I made couscous flavored with lemon and a few strands of saffron. On the side you see this year's fresh asparagus with a light drizzle of lemon juice, a few drops of balsamic vinegar and toasted, slivered almonds. This meal is quick and easy to prepare and bursting with the flavors of the Mediterranean. Don't plan on having leftovers!